I really enjoyed the first two Diamond Girls books. They had clear messages, good premises, and I flew through them super quick. When I heard that defenseless would feature a hero who was a fighter, I got super excited. Unbreakable had the bad boy I love, and now Defenseless had the fighter I would no doubt fangirl over. And you know what? I totally did. I loved Ryker, and I liked Claire, and I ended up enjoying this entire story. Claire is a spunky, devoted cheerleader. She wants to win, and she's going to work her little booty off to do it. She's also a pretty good person. Cares about her friends and would do anything for them. And we can also add brave to her list of qualities because she's a flyer and flying can be terrifying, thank you very much. (For real, I used to cheer. This girl flies without a backspot like it's no big deal. Bravery and confidence, right there.) (Also, skill. But that's beside the point.) Overall, I liked Claire. I understood Claire. Ryker is our fighter guy. Completely misunderstood by his family, thus leaving him with pretty much no family that gives a crap about him. I felt so much for this guy. So kind, and sweet, and caring, yet he made some mistakes and BAM. He's automatically kicked out of the family. Such bull. He was not his mother. He was driven and an honestly great person. I freaking loved him. The writing was again good and I flew through it super fast. The plot wasn't too surprising, but it got the points across, and I did enjoy it. The resolve at the end seemed a little sudden--a complete flip of where things were going, and I didn't see much build to get to that point, but I was happy with how it turned out. What I liked a lot about this one was that there was still a focus on an important issue--this time it was texting and driving--but the story didn't go out of the way to throw it in your face. It was placed well throughout so we got the point but it also didn't feel forced. The other themes of the novel shone through as well, and I thought it was all great. The romance made my heart feel a million times happy. I got my fighter in this one, but I was surprised to get more than I bargained for with that smexy pants fighter joining the team. I seriously squealed when the decision was made. Loved it! Ryker and Claire make the cutest couple, and I was rooting for them the whole time. I loved that their romance didn't drive my nerves up the wall, and instead just had me completely on their side. I felt good things. My only issue on the romance from was the fact that Ryker turned to calling her "Sweet Cheeks" after she insisted he stop calling her "Short Stack." I have no problem with calling her Sweet Cheeks sometimes, but when he was trying to be serious? I couldn't take it seriously. It didn't feel like an endearment to me, it felt like a joke. It was super cute most of the time! But sometimes...I wasn't feeling it. Plus, I thought Short Stack was sweet. 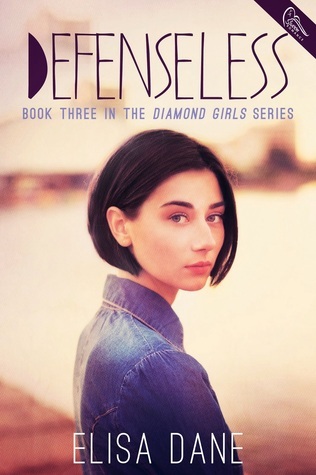 Overall, Defenseless is a great third book to the Diamon Girls series! Just might be my favorite...I'm not sure yet. If this one isn't my favorite, then it's tied with Unbreakable. I enjoyed the story and the characters so much, and I wish there could be more from them! I love Ryker and Claire. Their story was fabulous. 4 stars - An enjoyable, romantic story that hit some feels and twisted my heart! I think the excerpt was great and I'm looking forward to reading this series. I enjoyed reading your review and learning about the book, thanks! I haven't heard of this series before. Glad you enjoyed this installment too!